One of Indy's favorite pastimes of late has been chasing the frisbee. Indy becomes excited the minute he even sees a frisbee! He'll chase it endlessly and has become a pretty good catch. Hey, who turned out the lights?!! Indy is very good at always returning the frisbee and dropping it at your feet for another throw. Neither of the girls ever took to playing frisbee (both of them will let it hit them without even attempting to catch it), so Indy has his favorite game all to himself! My sister recently adopted a lovely little liver Dalmatian from our friends Peggy and Tina at OBX Dalmatians. OBX Right As Rainn, "Rainn," came to meet her Dal cousins today. Here's Rainn, Tess, Jazz, Indy, and Dancer, all with their tongues hanging out after a nice romp in the yard. Tess thinks there's no better way to get to know your new cousin than by sticking your nose in her ear!! Here's Rainn cooling off in the grass after another round of chase and play. After dinner, we got everyone settled down enough to snap this photo for the family album. By the way, the third one in from the left is an imposter. It's a fox statue that lives on our deck, but even he wanted his photo taken with these canine cousins. We're pleased to welcome Rainn to our family. Our Dals all had a wonderful day chasing and playing and wrestling with Rainn. Jazz took a particular liking to her...must be a liver girl thing!! Dancer was kind of the odd man out among all the spotted dogs, but he did a good job keeping up with them playing in the yard, and I understand that he loves to wrestle with Rainn. Tess, Jazz, and Indy are looking forward to their next "Rainn" day! 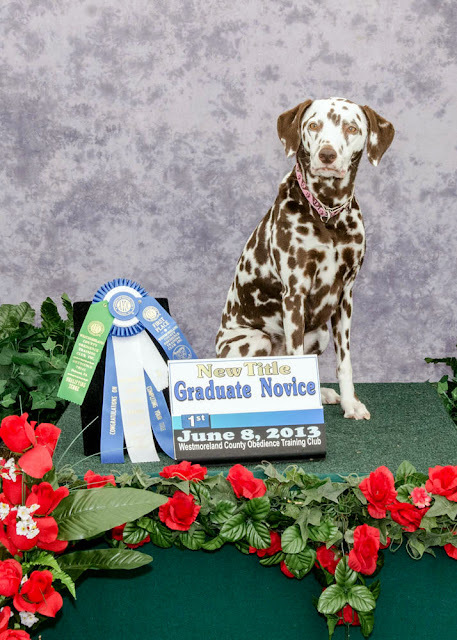 Jazz joined the ranks of June grads last weekend by earning her AKC Obedience Graduate Novice title at the Westmoreland Obedience Training Club trial! The Graduate Novice title is an optional title to help transition from Novice to Open. It involves heeling, figure 8, a drop on recall, a dumbbell recall, recall over a high jump, recall over a broad jump, and a 3-minute out of sight down-stay. Jazz completed all of these exercises nicely, and, in fact, was the only dog in the class of six who qualified. We're looking forward to moving into the Open class, as Jazz can perform all of those exercises and is even doing some work in the Utility class! Indy was also at this trial. On Friday, he earned his first Rally Advanced leg with a very nice score of 97. On Saturday, I decided to put him into Novice obedience, just to see where we were. I didn't have high expectations and basically just wanted to get him some ring experience. Well, the little guy did great and was on the road to qualifying...up until the last exercise before the group sits and downs. As I left Indy in what I thought was a sit-stay and started across the ring for his recall, I heard the pitter-patter of little paws behind me. Indy had broken his stay and was following me across the ring, and thus was not qualified. Despite that, I was very pleased with how well he did. He had beautiful heeling, on lead and off, and also a nice figure 8. He did his stand for exam flawlessly. I thought he did great for just 21 months old, and I'm anxious to continue our training and try again in the fall.